When I make a pizza, and I want to go "All Out" and really make a good one, I use a lot of fresh Basil. We would hit the supermarket, find a little plastic package with a couple fresh sprigs of the stuff, and buy it. All the while I am thinking of what my mom would say. "Bill? Why aren't you growing that?" Knowing her, there'd be a few random other things in there like "clean this", or move the car onto the roof, or some such blather mixed in. She had her way. Nothing was quite right. But as for the Basil, she was right. It really should have been grown at home, and in the garden. Why not, she did that off and on all through my childhood. I didn't really see the attraction. When I was a brat, it was too strong for me, and I used it sparingly. The last time I made a hoagie, I left the lettuce off and used a layer of Basil. That was a little bit too strong, but my tastes did change, somewhat. After many false starts of taking the leftover sprigs and trying to get them to root, only to find them melt to a green or brown mush in the bottom of a red solo cup next to the kitchen window that was a perfect home for my pet mosquito collection, I gave up. Then I got the bright idea to buy one of those rather pricey starter/started plants at the supermarket. I made a pizza the next day, and it was good. The Italian Flag pizza of Red Sauce, White Mozzarella, and Green Basil was perfect. I didn't use too much of the green goodness, and I still had some in the pot growing. Promising myself to stick it in a pot on the irrigation chain "tomorrow", I left it on my window sill. A bit too long, half of the plants moped away and faded to nothing. By the time it made it to the white ceramic pot mid way down the pool, there was only one healthy plant left along with a few others that looked quite sad. I wouldn't put those on a pizza, trust me. After silencing my "External Voice" of someone who constantly told me that "Basil Won't Grow In This Climate!" and "When Are You Going To Do Something With That? ", I finally planted it. Setting the drip feed on low, it watered it gently along with the other flower pots. Suddenly I had enough Basil to consider putting on a sandwich again. Then enough for a Pizza. The little pot was a happy place in the full sun of my Florida backyard in Spring. 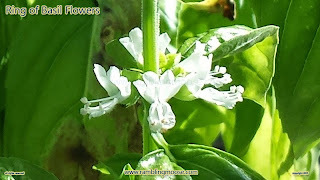 Wandering out the other day to get some fresh Basil for the salad I was making, I noticed a flash of white. 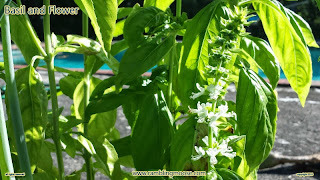 My Basil that wasn't supposed to grow in this climate was so happy that it was putting out a flower spike. An inflorescence that looked like the Coleus in the corner of the yard. I had to get a picture of that spike, not so much to say "Look at what happened" but more to actually look at what happened. Just like my Coleus that is so happy that it is going into year 9 of growing under my Bougainvillea, I had some tiny flowers. I could hear Mom again. "Bill, you want to pick those flowers or it will go to seed!". Yeah, yeah, yeah, Mom, You're right, and that is what I want. I'll get more plants that way. At least I hope so. But I had to get a good close up view of these things. They were tiny. The entire ring of flowers would fit on my thumbnail. All the while guaranteeing some good sandwiches and salads in the future. Everyone here helps out. We make sure it is watered. I do have to make sure that Rack isn't helping there. We have caught him doing so. Better wash that Basil well! You know who helps out! So my little herb garden is growing. Rosemary for rolls, pizza sauce, and other sauces. Every time I brush against it, the Rosemary Oil perfumes me. Basil for the same thing, more sauces. Mint, courtesy of my godmother who knew I liked a lot of Mint Tea. And on a whim, a little Green Onion for my stirfry. If I could just get the dog to stop watering the stuff!